James Falzone’s musical career began with Peter and the Wolf and has since expanded into the far-reaching realms of classical, jazz, Arabic music, and beyond. These days he is the Chair of Music at Cornish College of the Arts and clarinetist of the Allos Musica ensemble. The group features oud (an ancient Arabic lute), voice, accordion, and a wide array of wind and percussion instruments from around the world—and you can hear them in action on October 25 when they perform as part of the Earshot Jazz Festival. In this interview, Falzone talks about how his eclectic taste in music came to be (it started with a 5th grade teacher), and what Allos does. He also talks about the importance of improvisation for musicians, and about what audiences can expect to hear at their upcoming performance. Allos Musica performs as part of the Earshot Jazz Festival on Thursday, Oct. 25 at 7pm and 9:30pm at the Royal Room. Click here for more information. James Falzone and Bonnie Whiting present a seamless evening of original, composed, and improvised music based on text, spoken word, and translation. TSE melds the artistic mediums of art and literature in this concert in which each piece is inspired by texts from different authors. Curated by Seattle composer Adam Haws, this program spans centuries and genres with a re-imagining of Bach, tunes from jazz and rock greats, & more. Kahane presents his song cycle Craigslistlieder, Schumann’s Dichterliebe, and songs from previous albums and brand new, unreleased material. SMQ showcases classical favorites and modern marimba repertoire from the 20th and 21st centuries plus drumming styles from around the world. SMO celebrates the centennial of American composer Robert Erickson and the 80th birthday of legendary Seattle trombonist and composer Stuart Dempster. Harpist Jennifer Ellis invites the audience to experience the customarily inaudible elements of this grand instrument. Music by Ellis, Andrew Stiefel & more. 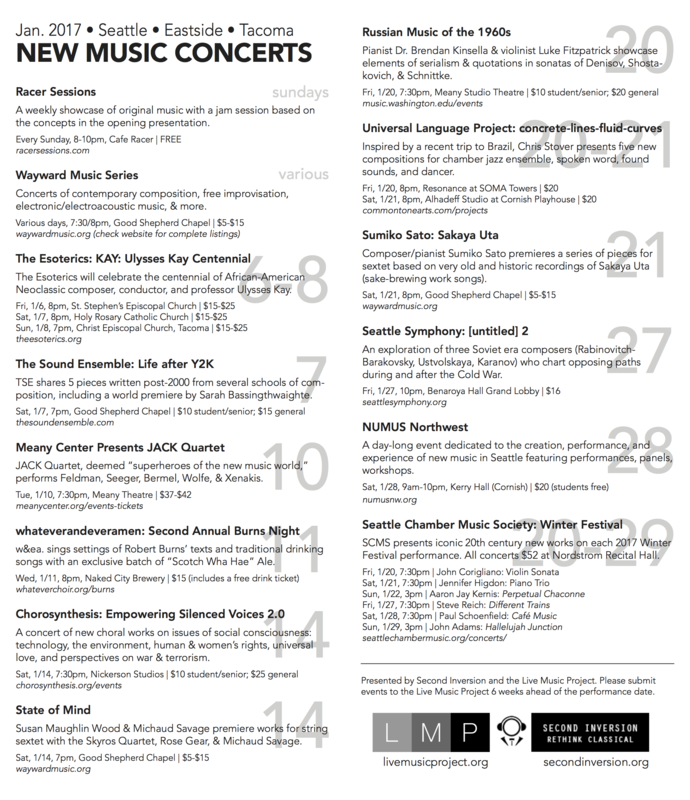 SMCO partners with Seattle Art Museum to trace the natural inspirations of composers of four different time periods, comparing their music to the visual art of their contemporaries. Specializing in performing hidden gems of modern classical music, Cursive presents a unique program inspired by the passions and unease of changing seasons. John Muehleisen uses the passion form to explore how we might find healing in the face of unspeakable tragedy, honoring and bringing voice to veterans and families. Philharmonia Northwest presents the West Coast premiere of PDQ Bach’s Concerto for Simply Grand Piano and Orchestra with pianist Jeffrey Biegel. Marimba sounds merge with intimate whispering, stream-of-consciousness thoughts, DIY life philosophy, and beautifully minimal music. Featuring Erin Jorgensen and curated by Jim Holt.